Welcome to Day #13 of Chocolate and Mint Theme Week. Today's two featured 70% dark chocolates were both produced in the UK and distributed by Divine Chocolate Inc. (Washington, D.C.). 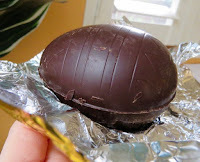 The first was a Dark Chocolate with Mint Crisp bar and the second was a Dark Chocolate Easter Egg. These relatively new offerings included new packaging and design elements as well. 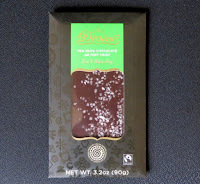 The Divine 70% Dark Chocolate with Mint Crisp bar had a relatively strong, but balanced peppermint aroma. The flavorful, slightly earthy, chocolately base dark chocolate shone through. 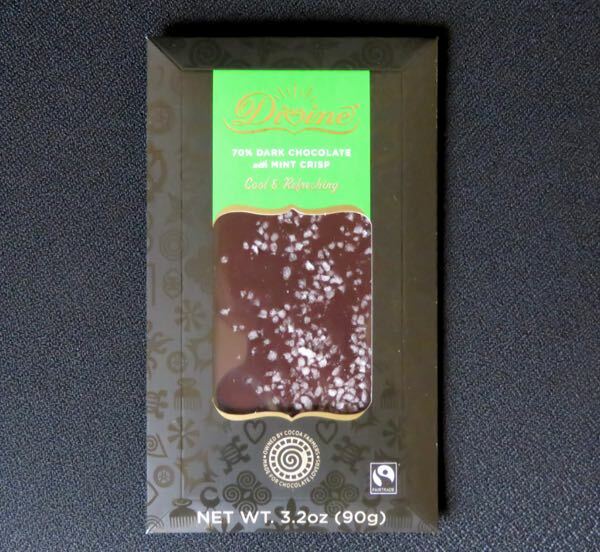 A similar (but not identical) Divine mint chocolate bar was previously featured on this site. It was segmented into scored, rectangular pieces and the packaging, adorned with green and gold African-inspired symbols, covered the entire bar. 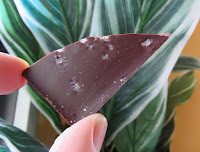 This new bar, decorated by a fine smattering of small mint crisp bits, was designed as uniform chocolate bar (longer segmented into rectangles), and was viewable through a clear window. The company name "Divine" was printed in a repeating pattern on the back of the bar. 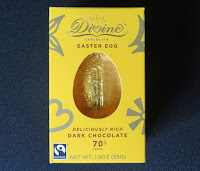 Because Easter is upon us, it seemed appropriate to include a 70% Dark Chocolate Easter Egg, also from Divine. The sunny yellow box design incorporated an attractive array of large gold pattern symbols. The hollow egg was carefully broken, and shards of egg were sampled and enjoyed.